In order for the vision of a designer or director to become reality, skilled craftsmen and technicians must bridge the gap behind the scenes. 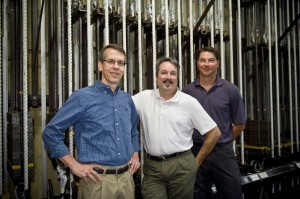 The Wright State Theatre Design and Technology staff is responsible for the creation of the sets, lighting, sound, costumes, and props that have helped put Wright State Theatre on the map and brought the university national acclaim. The staff is comprised of Tim Judge, technical director/production manager; Janet Denman, costumer; Carly Kimmins, assistant costumer; John Lavarnway, properties master; and James Dunlap, audio coordinator. (L-R) Theatre Design and Technology staff members Tim Judge, technical director/production manager; John Lavarnway, properties master; and James Dunlap, audio coordinator. Not pictured: Costumer Janet Denman and Assistant Costumer Carly Kimmins were also critical members of this award-winning team. The Design/Tech staff collaborates on all theatre productions, which in their scope and variety rival any theatre or entertainment venue in the region. The staff is not only responsible for constructing and devising all the physical aspects of every production, they also teach undergraduate students the skills of their particular artisanship. In a typical season at Wright State, the Design/Tech staff constructs more than 50 individual scenic units (painted backdrops, stationary, and moving scenic items and platforms); creates and adapts 500 to 700 costumes; fits 200 student performers with microphones; and builds or adapts 200 to 500 property elements. The proof of the staff’s exceptional work is in the nearly 100 percent employment by Wright State technical theatre graduates, many of whom work on Broadway, on national tours, at major regional theatres, and in corporate entertainment venues and supply houses.